DAD Fighting for Life with a major Brain and Chest Injuries with multiple fractures, needs Financial Support to survive. "Dad was on two wheeler travelling towards isnapur near outer ring road on 22 nd may. A car from the extreme left tried to take a sudden U-turn without any indication, that led to a huge accident. He was moved to the near by govt hospital with the help of the crowd over there . By the time they reached the govt hospital his ears started bleeding and he was completely unconscious. 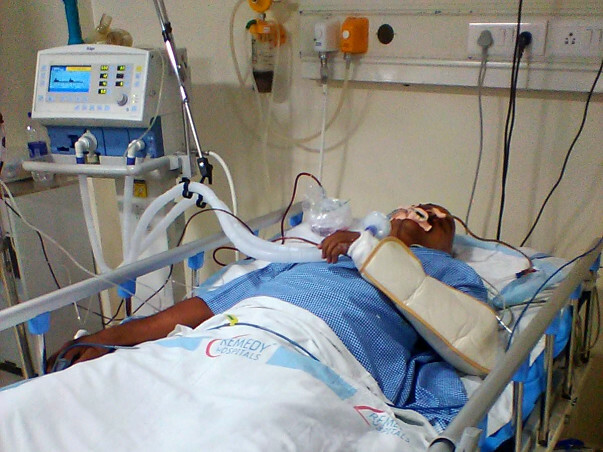 After an immediate First aid he was suggested to move to Gandhi hospital. his condition became critical such that we were supposed to move him to a near by hospital. We admitted him in the Remedy hospital (KPHB). At Remedy, it was confirmed that he have a major and few minor blood clots in the brain and multiple fractures in the rib cage. And he was completely on ventilator support in the ICU . On 22 nd we deposited an amount of 163000 for the surgery and pharmacy. His condition was a bit better after the surgery . He was unconscious but he was able move his limbs and hand . His condition haven't get any remarkable improvement, but we were supposed to pay around 175000 for the completed treatment and an amount of 70000 (approximately) per day for continuing the treatment. We were completely in debts by the end of day one . On the suggestion of the Dr. Rohith Kumar (Neuro surgeon ) we shifted him to Mallareddy Narayana (Suraram) on 26 th may. After regular formalities he was moved to the ICU. As he was on ventilator for 4 days his mouth was infected. Which was done on 28 th may. " After 28 th may it took 14 days for dad to come into consciousness.. On 14 th june he opened his eyes a spoke a bit. But he was supposed to be in the Intensive care unit for another one and half week.... On 20th june based on surgeons advice we shifted him to ward... There his condition started improving day by day..... Right from 20th he started identifying every one.... Started talking...but one thing his mental stability got disturbed since he has been in hospital environment for past 38 days.... So on doctors advice we have decided to take dad to home.There in that homely atmosphere he would be much more better..... The course of medicines are to be continued for years together which costs around one lakh fifty thousand per year and a regular phisiotherapy has to be given for atleast two months which costs around thirty thousand per month.... He is supposed to take to rehabilitation center also...... So far we have paid a sum of rupees three lakh fifty thousand rupees in hospital and we need to pay an another sum of rupees one lakh five thousand to get discharge from hospital....... We are really thankful for your great valuable concern, support which made my dad live today..